What does a Pinched Nerve in the Shoulder Blade Mean? Your nerves are surrounded by a mixture of cartilage, muscles, bones, and tendons. Due to how much freedom we have in our motions, it’s not uncommon for a nerve to get a little squashed every now and then. Unfortunately, a pinched nerve in the shoulder blade is very unpleasant. The “pins and needles” sensation you feel from resting on your arm is an example of what happens when a nerve is temporarily compressed.In some cases, the pressure on the nerve is more long-term and creates what’s known as a “pinched nerve”. These mainly happen in the shoulder blade area because of how much movement goes on in that area. Pinched nerve in shoulder blade can range from mild annoyances to crippling impediments to a normal quality of life, so getting them addressed is always important. Pain: Whether it is a burning, throbbing, or shooting pain, a pinched nerve is likely going to cause some form of hurt. This can come from the compressed nerve itself or the muscle spasms that in the shoulder blade sometimes accompany them. The pain from a pinched nerve sometimes seems to be radiating or traveling along one part of the body as well. Weakness: Nerves affect how your muscles operate and a pinched nerve will affect your shoulder blades and shoulders in general. You will likely find it difficult to lift objects or even raise your arms over your head. Weaknesses in grip or mobility can affect a single hand or the entire arm, depending on which nerve is affected. Tingling: As mentioned above, the pins and needles sensation of a limb having fallen asleep happens when a nerve is compressed. This is called paresthesia and can also be accompanied by numbness along the affected area. The specific location and frequency of the symptoms will depend on a combination of what is causing the pinching, which nerve is being affected, and how severe the problem is. Symptoms of a pinched nerve in shoulder blade can come in waves, have a more ongoing presence, or simply appear and vanish quickly. Swelling or inflammation: Pinched nerves tend to arise when nearby swelling begins to cause compression. Carpal tunnel syndrome for instance occurs when there is a pinched nerve in the wrist area; it can cause the surrounding tendons or ligaments to swell. Swelling and inflammation can also be caused by repetitive stress, poor posture, or illness. Injury: The nerves around the shoulder blades can become pinched between bone spurs around your spinal discs. Bone spurs are little outgrowths of bone that grow on top of normal bone, but they can also occur naturally as the spine compresses while we age. Illness: Lupus, diabetes, arthritis, hyperthyroidism, and many other conditions can trigger swelling in your joints and result in a pinched nerve. Obstructions like cysts or tumors can also play a part in this. Posture: Poor posture and weight distribution can put undue pressure on the nerves in your shoulder blade. This can be attributed to posture habits, pregnancy, obesity, and even having large breasts. 1. Get enough rest: At the most basic level, resting is a direct means of easing the pain caused by a pinched shoulder nerve. Generally speaking, you will want to avoid moving the affected arm or your neck when possible. Modifying your sleeping posture may also be advised, but it will depend on the exact nerve in question. 2. Use a traction collar: Depending on the nerve, you may end up wearing a traction collar to help keep your neck immobile. The physician who makes the diagnoses will be able to provide more tailored advice. 3. Hot and cold therapy: Compresses can also be used to soothe swelling and inflammation. Apply a hot compress on the site for around fifteen minutes and then swap to a cold compress for another fifteen minutes. Repeat as needed until the area feels better. 4. Over-the-counter painkillers: As with many medical problems, drugs can help as well. Specifically non-steroidal anti-inflammatories (NSAIDS) or painkillers in either over-the-counter or prescription form. 5. Honey and cinnamon paste: If you want to try a natural remedy, you can also make a paste of honey and cinnamon to apply to the shoulder area. Let it sit for around ten minutes before washing it off. Physical therapy is also an option to treat a pinched nerve in the shoulder blade. A physical therapist can work you through exercises designed to strengthen the muscles and relieve pressure. The pendulum: Lie down on the bed and let one arm hang over the side. Slowly swing it back and forth. This may trigger pain, but bear it if you can. Increase your speed as the pain subsides and continue for 30 seconds to a full minute. As you perform the exercise over several days, try to increase your endurance time. Arm circles: Stand in an open area and extend your arms with hands outstretched so you are making a T with the floor. Begin to rotate your arms in small circles for about ten seconds, and then stop and repeat in the opposite direction. Two sets of ten seconds on each arm is a good goal. Just because your nerve is getting trapped doesn’t mean you have to be. If you have a pinched nerve in shoulder blade, speak to your doctor about ways you can be treated and improve your quality of life. 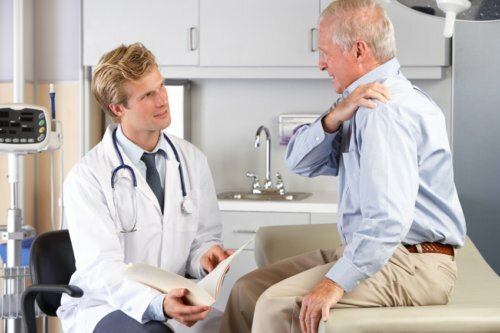 “Pinched Nerve in Shoulder Blade: Causes and Treatments,” New Health Advisor web site, http://www.newhealthadvisor.com/Pinched-Nerve-Shoulder-Blade.html, last accessed November 26, 2015. “Pinched Nerve,” Mayo Clinic web site, January 2, 2014; http://www.mayoclinic.org/diseases-conditions/pinched-nerve/basics/definition/con-20029601. Roland, J., “Is a Pinched Nerve Causing Your Shoulder Pain?” Healthline web site, January 21, 2015; http://www.healthline.com/health/pinched-nerve-shoulder-pain#Overview1.